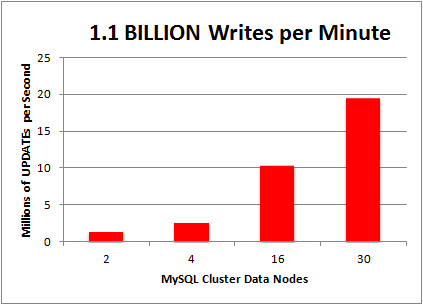 We've recently seen some great announcements of MySQL Cluster delivering amazing results for both selects and updates. The posts (see related articles below) are full of juicy technical details and proofs, but today I'd like to change the perspective a bit. Let's compare those figures with real-world data and imagine what could be done. Please note that I'm not using any scientific method here, just dreaming about the unlimited opportunities offered by MySQL Cluster today. In a previous article, I've already talked about an optimized way to connect locations in a geographic point of view by using MySQL. In this manner, locations of pubs, drugstores, barbers or even users can be obtained. Communities, or perhaps I should use the newer term Social Networks, make use of the buddy network of indiviual members in addition to the geographical mapping. This has many psychological advantages, because new members can be integrated in an established network very easily and I'm more willing to become involved when I already know some of the members. "MySQL & Friends" DevRoom@FOSDEM schedule published, want to join us for dinner on Saturday evening? The tracks of this year's "MySQL & Friends" Developer Room at FOSDEM 2010 have now been scheduled - please check the Wiki page for details on the talks as well as some background information about the speakers. This info should soon be available via the FOSDEM conference system as well. We had some last-minute changes and we actually managed to schedule two more talks due to a small glitch in the initial calculation. The topics look very interesting, we hope that we can provide some valuable information for developers, users as well as MySQL DBAs!